Just a super quick post tonight to send get well wishes to Cath (yes, that Cath of Moxie Fab and PaperCrafts)! She's been nursing a broken wing (rotator cuff) and had to miss out on winter CHA which is in full swing as we speak (read more about it here). So tonight I'm joining in with other Moxie Fab fans to wish Cath a speedy recovery! Totally adorable JJ! I just sent happy mail your way (PTI set Itty Bitty Bird). =0) I am definitely following your blog! I LOVE your rainbow cloud and the matching rain drops, so clever!! What a great get well card! Me too! Love the rainbow clouds and the rain. Super cute! and the senitment is perfect. Love your card, JJ! This is gorgeous! Another clever use of these rainbow cut outs, and a great CAS design! Oh wow, love what you created. Such a fab design - truly adorable. SO adorable! Love your rainbow! love that rainbow in the cloud, so clever!!! You make such awesome cards, always amaze me and this one is no exception. Oh and can you tell me about the supplies you used? Absolutely adorable and so very clever to put the rainbow inside the cloud. Love the cheerful look of your card for Cath! So cheery and fun. Beautiful card and sentiment. so cute and colorful--love the rainbow cloud! I absolutely adore the rainbow cloud!! What a great and cute card. Love the rainbow cloud. Thanks for sharing! How moxie fab is this card, JJ? How could I not feel cheered after seeing this cutie? I love the rainbow cloud dropping its colorful dots! And the twine? Sets it all off perfectly! Thank you so much for taking the time and trouble to work this up on my behalf. I appreciate it more than I can say, and feel incredibly loved. So SWEET!!!!! Loving the CAS design, the rainbow cloud and those adorable raindrops! What a wonderful card!! Love the how colorful and bright it is. Fab job!! That rainbow cloud is such a fabulous idea!! Oh my gosh, a rainbow cloud....Amazing! Good to see those rainbow pieces getting put to fabulous use! :) Love those little raindrops too. JJ - What a sweetie you are! Great card for Cath! 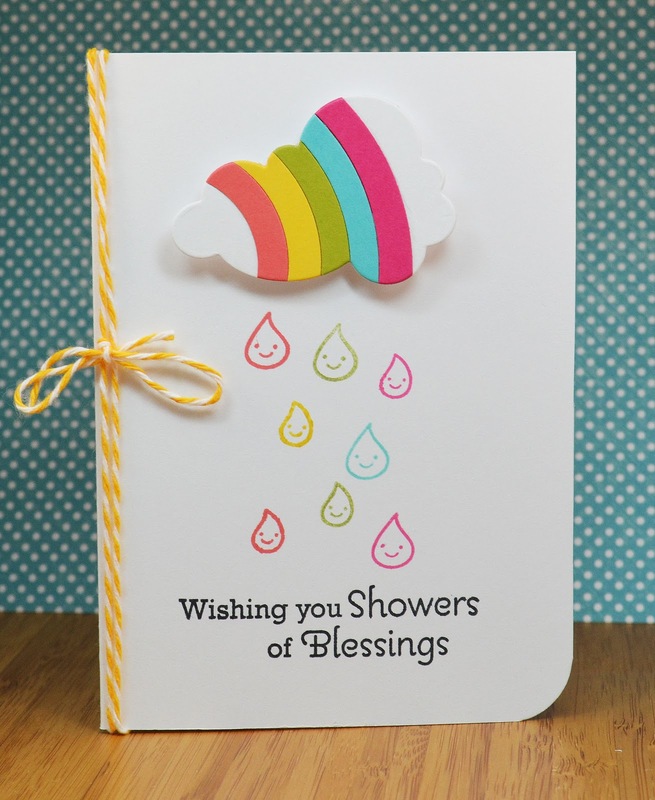 So pretty with the rainbow and the sweet drops of rain! Oh my gosh - sweetest card ever! Oh my goodness is your card ever cute and clever! I adore the rainbow within the cloud! Brilliant job on a sweet card. CAS but so beautiful. Love this! I adore this CAS card! That rainbow cloud is perfect and I love all of the colored drops! Great job!